The Stanley engineers ball pein hammers are designed with a solid graphite core shaft. 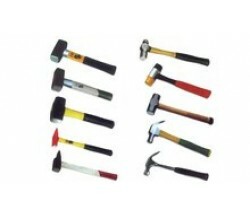 These hammers..
Thor cylindrical copper faces are manufactured from 99.9% pure extruded electrolytic copper rod. The.. Size = 1 Weight gr = 850 Handle Lenght = 305mm Face Diameter = 32mm.. Size = 2 Weight gr = 1300 Handle Lenght = 305mm Face Diameter = 38mm.. Size = 3 Weight gr = 1975 Handle Lenght = 305mm Face Diameter = 44mm.. Size = 4 Weight gr = 2950 Handle Lenght = 355mm Face Diameter = 50mm..
Thor copper hammers have a malleable Iron head fitted with two cylindrical faces of pure electrolyti.. Timber Handle with replaceable white nylon heads Nylon Faces - 1".. Timber Handle with replaceable white nylon heads. Nylon Face 1 1/4".. Replacement screw-in plastic orange faces for Thor plastic hammers. Medium hard all purpose face,.. Timber Handle with replaceable white nylon heads Nylon Faces - 1 1/2".. Timber Handle with replaceable white nylon heads Nylon Faces - 1 3/4"..
Thorace dead blow hammers have a coated die-cast head & handle of aluminium alloy with shock absorbe..
Pin hammer cross pein with an Evertite ash handle, for driving panel pins or small nails. Head we.. Cast iron head fittd with 2 rawhide faces and wooden handle..